Slate tile is an exceptionally versatile and durable choice for both floors and countertops. The non-porous nature of the stone, combined with the natural cleft finish makes it both waterproof and slip resistant. It comes in varying gradients of color, making it an excellent neutral choice for vibrantly colored rooms. The enduring beauty of slate tile enhances any setting. Due to its durable nature, slate tile makes an excellent choice for high-traffic areas. With proper maintenance and care, slate tile, unlike wood flooring or carpeting, shows very little wear. Since the stone is non-porous, it’s also stain and moisture resistant. With proper insulation, slate tile maintains a steady temperature, providing a cool surface in summer and remaining warm in winter. If you want to learn more about how slate tile could fit into your renovation plans, we provide design inspiration to help you pull together a pallet to create the warm and inviting rooms you desire. Nearly every task that’s completed in the kitchen takes place on the countertop. Slate countertops offer a naturally bacteria and moisture resistant surface which is easy to clean and requires almost no maintenance. While slate is extremely durable, it offers a less-rigid surface than granite or other natural materials. A tipped-over glass will likely not break against the slate. Rounded edges and corners provide safety and prevent chipping. 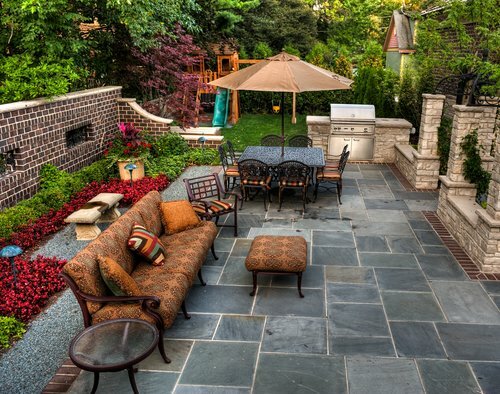 Unlike other natural stones, slate does not require annual sealing. It is impervious to heat and is not marred by contact with hot pans or other utensils. Contact Macadam Floor and Design to learn more about how slate countertops can enhance your kitchen. Home renovations represent a significant investment, both in time and money. Macadam Floor and Design understands that deciding who you are letting in your house is a big decision. We work only with excellent, trustworthy people who share our passion for quality. You can find different brands such as Dal Tile, Emser, Pental, Tierra Sol and United Tile. Contact us today to schedule your consultation.